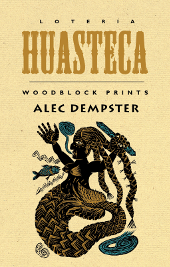 Categorizing Alec Dempster’s Lotería Huasteca as an art book is tricky. Nominally a book of themed woodblock prints based on an eastern Mexican subculture, the book’s scope is actually far broader. It stretches beyond the merely visual, incorporating history, music, mythology, and even food into a creation that reads more like a tour de force than an artistic collection. While the theme of this collection is the culture of the Huasteca region of eastern Mexico, the lens through which Dempster views it adds layers of interpretation to his work. His organizational principle is the lotería, an ancient game originally played in Italy and Spain and still played in Mexico. Using a complicated system of cards, luck, and almost arcane traditional interpretations of symbols, it performs the magic trick of producing money from nowhere, generally for charitable causes. Likewise, the cards that Dempster has created, as well as the brief explanations that accompany each one, evoke awe and resonance. It is impossible to read this book without coming away richer in understanding of an old and beautiful corner of the world. Dempster’s visual work is deeply complex, its individual subjects ranging from innocuous-seeming representations of ordinary life to symbols recalling Jungian archetypes. Though the accompanying text enriches their connection to Huasteca culture, particularly for audiences who might not be personally familiar with the region, the prints also stand on their own quite well. In addition to the contrast of stark black and white, Dempster’s work constantly joins aggressive angles with flowing lines in an active, almost dance-like synergy. In fact, the images evoke music both overtly and subtly. This is a book with a soundtrack of guitars, tambores, and violins. With a bare few words and a strong musician presence in the artwork itself, the author implies that this culture is inseparable from its music, and vice versa. Just like with the relatively modern sensibilities of cane wine and the musical instrument the rabel, music is woven into Huasteca history and Huasteca history is woven into its mythology. Anyone who cracks the cover of this unique book can expect to find themselves seeking out the melodies that helped to inspire its creation. It is impossible to look at these prints and not be drawn in, desirous for more. Footnoted and lovingly researched, Lotería Huasteca is a beautiful combination of the author’s lived experience in eastern Mexico, his emotional impression of the Huasteca region, and his zealous self-education about the roots of the culture he celebrates. This is celebration sincere and genuine, an appreciation by an artist whose love for his art and for his subject shines through every print. Lotería Huasteca reads like a tarot card spread of a vital, mythologically infused world. 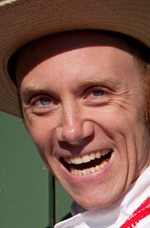 It’s a land where poets cry out, "Let the music resume!" and a mighty cosmic caiman battles an even mightier corn god. Challenging, fascinating, and often deep, it is a glimpse into an intoxicatingly rich culture and a sure pick for those who appreciate art and for fans of Mexican cultures. Initially I hesitated to embark on the project since the culture of northern Veracruz and the rest of the Huasteca was foreign to me, unlike son jarocho, the folk music from southern Veracruz, which had become second nature after prolonged immersion, marriage and an inexplicable affinity for the music. The thought of the months it would take to create a completely new series of fifty-four prints for another lotería was also a consideration. Nonetheless, the ebullient weekend in Citlaltepec that followed was all it took for me to commit to the project. I succumbed to the percussive throb of collective dancing, the nimble fantasia of countless violinists, impromptu poetic duels between singers, an eye-opening stroll through a huastecan market and my first taste of zacahuil (an enormous tamale usually reserved for special occasions). ‘The title is quite an understatement. In fact the book is not only a collection of the wonderful woodblocks by Dempster, which in itself would not be bad at all. But it is rather an illustrated encyclopedia of the rich Mexican Huastaca culture all together. ‘The texts accompanying the graphic works open up a completely unknown world to us, of the animals and the people that live in the Huasteca region, of their history and their products, the struggles for daily life and the historic background and myths. We can be pretty much overwhelmed just by reading all about it.